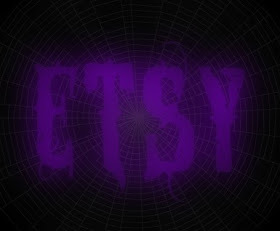 ARTISTIC HALLOWEEN QUEENS: Yet Another Queenly Giveaway! 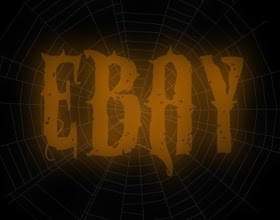 Yep those Halloween Queens are having another awesome giveaway!! 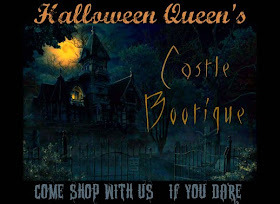 What better way to remind you of their May 1st Castle Bootique update. This month's prize was donated by Lisa of Peal Avenue Studios. 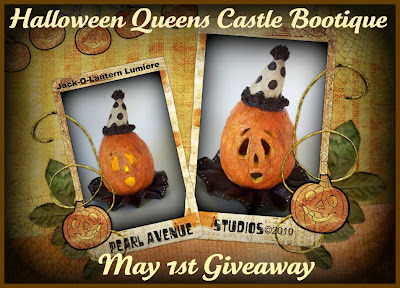 Celebrate your vintage Halloween with this One of a kind Jack-O-Lantern Lumiere! Sculpted of paper mache, this Jack-O-Lantern lifts off of ruffled collar, where a standard LED battery candle sits. (included) Measures 5". So sign up for your chance to win! 1~Tell us your favorite Halloween costume as a child. 2~Become a follower or remind us you already follow us. 3~Sign up for our mailing list or tells you have already signed up. Possible four chances to win! Please make sure we have a way to contact you when you win!!!! What a great give away! My favourite costume was the Wicked Witch of the West made by my very talented great-aunt Nell forty two years ago! My favorite costume as a child was a gypsy. Oooooo, I LOVE Lisa's work! I am already a follower and will now sign up for your mailing list. Love this website and please put me on the mailing list. I am not sure just when the new pieces are available. Is it the 1st or the 15th?? I don't want to miss a one opportunity. As far as costume, that was long ago. But the favorite one I made my daughter was a big pair of red lips, with glitter all over. I always dressed up as a vampire. That was my favorite costume. Even wore it to church Halloween parties! I won first prize in Kindergarten as the Frankensteins' Monster. As a child (about 9 and up) , and even now I dressed up as a Vampire every year ! My favorite costume was one my Mom made. She made me a blue cowgirl skirt and vest out of crepe paper and I wore that over shorts and a white sweater. Even though it was only crepe I thought I looked cool in the blue skirt and vest. I'm going to go blog right now. Great giveaway. My favorite costume was dressing up as a scarecrow. My favorite costume as a child was one that my mother had used as a child. So I was a late 1930's clown. Wish we had taken some pictures of that. I am a follower and am on your mailing list. Now I am off to blog away. I adored my Sleeping Beauty costume, with it's deep -blue dress and sparkly, silver trim! Already a follower! Love this piece! My favorite costume as a child was the clown one my mom made me. I would love to sign up for the mailing list...where is the link? For our first Halloween in the US my mother bought me a Woody Woodpecker costume... there's even a picture of me in it somewhere! I loved it even when the painted gauze mask sort of softened and sagged ( this was back in the early '50's!). I'm a foolower... but couldn't figure out how to sign up for the newsletter. An opportunity to win one of Lisa's creations? COUNT ME IN!!!! My favorite costume as a child was a witch. I borrowed an old black skirt from the closet of dress up clothes, and my mom painted my face with green stage makeup and used black eyeliner to line my face features. It took gobs of cold cream to get that green makeup off! I added myself as a follower and my name to the mailing list. I missed last month's giveway, so hopefully I'm in the running for this month. I support many of the EHAG artists, The Spooky Time Jingles artists, Mealy Monster, Pearl Avenue Studios, Bone Head Studios, and I am a member of Cloth and Clay Art Doll ning, Moss Hill Studios Bella Art Doll site, Nancye's Art Dolls...come join the fun! Make dolls with these wonderful instructors...I know some of the Halloween gals are members too! Please enter me in the fabulous Pearl Avenue giveaway! What a great giveaway! I am now a follower. I am posting to my blog about your giveaway. Wow! What a great give away. I love Lisa's work. As a child, I always cherished my gypsy costume. I wore it many times. I currently follow your blog. Thanks! My favorite costume as a child was Casper, I still love Casper, lol. Yep, already signed up for your newsletter. and I just blogged about this wonderful giveaway and put it on my sidebar!! Whoo hooo, good luck every one!! Hooray! I'm a long time follower. This little Pumpkin head is too cute! Love this blog and giveaway! My mom made me into a giant crepe paper pumpkin one year. I couldn't sit! When I was in 3rd grade my best friend's mom made us both Black Cat Costumes. I thought that was awesome we both were black cats! I am already a follower and I am going to blog about the giveaway right away! I love the creation .I follow the newletter blogs etc .I have a geat love for halloween .It's the only holiday for me.I have to say my favorite costume from my childhood was a costume my mom made because we couldn't afford a new one .My mom sewed on it for a week it was black with ears on the hood don't know if it was a werewolf or dog .I wore it to school my classmates made fun of it but it was special to me my mom made it .I never told her the truth i was made fun of i told her they liked it.I will also get blogging .Thank's for bringing this fond memory back.I lost my mom to cancer a few years back . Oooo...the Jack-o-Lantern is totally adorable. Lisa does great work. My favorite childhood costume was probably the year my mom made me my clown outfit and put my hair in pig tails and teased the heck out of it...LOL! I loved the big shoes too! And will add it to my side bar. I'm looking forward to seeing everyone's entry in to your May Challenge...I just know it's going to be scary in a wonderful way. I love this blog, and I am your newest follower. I can't wait to see what you share next. My favorite costume as a child was a witch costume ofcourse. I loved it, and nobody in the class guessed it was me behind the scary mask. I won BEST costume. What fun it was. Again thank you for the wonderful opportunity to win this absolutely precious jack-o-lantern in May ofcourse. Any one of us will be so lucky to win. I love Tamara Dozier's work. My favorite piece is the "Bad Choices Made." When I saw that piece for the first time it really affected me in a way that was bittersweet. It was truly amazing to go to that place inside.